Nell Hardy Carter was an American actress and vocalist who enjoyed a twenty-five year career in film, stage, television, and the recording industry. Born as Nell Ruth Hardy on September 13, 1948 in Birmingham, Alabama, she and her eight siblings were raised a low-income neighborhood by their parents, Horace L. and Edna M. Hardy. At the age of 11 she sang in a church choir and in youth groups. She also appeared on “The Y Teens,” a local radio show. After graduating from A.H. Parker High School in Birmingham in 1966, she moved to New York City, New York and changed her surname to Carter. At first she performed in nightclubs and coffee houses. In January 1971, however, she landed her first Broadway stage role as “Sharon” in Soon, which also starred Richard Gere and Barry Bostwick. In 1974 she was the musical director for What Time of Night It Is, a Westbeth Playwrights Feminist Collective production. Also in 1974, she appeared in the musical Miss Moffat alongside Bette Davis. 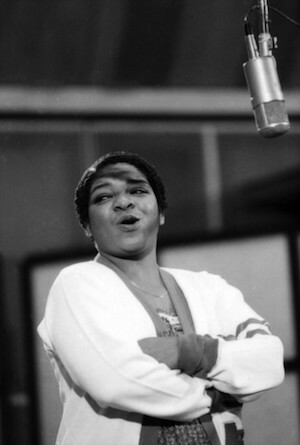 In 1978 Carter was cast in the musical revue, Ain’t Misbehavin.’ She won a Tony award for her performance as “Nell.” She reprised this role in 1982 in the televised version on NBC, garnering an Emmy award. Carter is best known for her starring role in Gimme a Break!, an NBC sitcom that ran from October 1981 through May 1987. Here she starred as Nellie Ruth “Nell” Harper, a housekeeper and parent figure to the Kanisky family. This role garnered her two Emmy and two Golden Globe nominations. Carter went on to appear in a number of movies and television shows including The Grass Harp (1995), The Proprietor (1996), Hangin’ with Mr. Cooper, You Take the Kids, and Ally McBeal. Also during the 1990s, she provided voiceovers for several characters in animated projects, such as Bebe’s Kids (1992). In 1997, Carter returned to Broadway to play Mrs. Hannigan in the twentieth anniversary revival of Annie. However, she claimed racism when advertisements appeared that featured a white woman in the role instead of her. The producers denied the allegation and during the controversy, Carter experienced a number of diabetes-related incidents including her collapse during a performance from lack of insulin. The play producers replaced her with Sally Struthers. Although Carter appeared to rise quickly to fame, the Annie episode reflected numerous personal and professional difficulties generally unknown to the public. In the early 1980s, she attempted suicide and became addicted to drugs. After several failed rehab attempts she was able to maintain sobriety by the late 1990s. Carter married George Krynicki in 1982, but the couple divorced in 1992. That same year, she married Roger Larocque, but it ended 1993. She suffered an aneurysm in 1992. Carter also miscarried several times and decided to adopt two sons, Joshua and Daniel. In 2002, she accepted the role of Mama Lena in the revival of the play A Raisin in the Sun. However, just two weeks before the opening, Joshua found her on January 23, 2003 in their Beverly Hills, California home. She died from heart and diabetic complications. Carter left her children in the care of her domestic partner Ann Kaser, a woman once referred to as her friend and business partner. Tina Gianoulis and Claude J. Summers, eds., “Nell Carter,” An Encyclopedia of Gay, Lesbian, Bisexual, Transgender, and Queer Culture (Chicago: GLBTQ, Inc., 2015) Retrieved from http://www.glbtq.com/arts/carter_nell,2.html; Linnea Crowther, “The Highs and Lows of Nell Carter.” Retrieved from http://www.legacy.com/news/legends-and-legacies/the-highs-and-lows-of-nell-carter/1044/; Kenneth Jones, ed., “Nell Carter, Ain't Misbehavin' Star, Dead at 54.” Retrieved from http://www.playbill.com/news/article/nell-carter-aint-misbehavin-star-dead-at-54-111157.